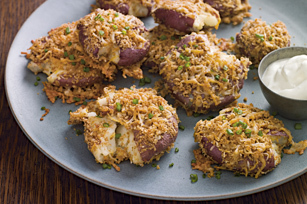 Give these smashed potatoes their rustic appeal with an uber-flavorful blend of bacon-cheese bread crumbs, fresh chives and a dollop of sour cream. This Rustic Smashed Potatoes recipe will become a new family favorite! Place potatoes on rimmed baking sheet sprayed with cooking spray; bake 20 to 25 min. or until tender. Meanwhile, combine coating mix, bacon and paprika in medium bowl; stir in cheese. Remove potatoes from baking sheet. Use back of spatula to flatten potatoes to 1/2-inch thickness. Brush both sides of each potato with egg, then coat evenly with cheese mixture. Return to baking sheet. Bake 15 min. or until crisp and golden brown. Sprinkle with chives. Serve with sour cream. We really love this recipe which was originally developed using our recently discontinued FRESH TAKE Cheese Bread Crumb Mix. We revised it to use KRAFT Shredded Cheese, SHAKE 'N BAKE Coating Mix and seasonings. Our Kraft Kitchens team has developed substitutions for the entire FRESH TAKE lineup so that you can continue to enjoy the great taste of these products. Click here for our Cheddar Jack & Bacon substitution guide. Give it a try! Store potatoes for up to 2 to 3 weeks in a cool, dark, well-ventilated place. Warmth encourages sprouting or shriveling, while prolonged exposure to light can turn potatoes green. Never store potatoes near onions, as gases given off by the onions cause potatoes to spoil faster.